Friday - All 3 of us had the day off (Fridays are my regular day off), so we used the time to wrap up some home improvement projects, including finishing the paint job in Benjamin's new room. He should be ready for the big move within the next few days! Saturday - We departed Rochester late morning to meet Dan and Katie at Rock Bottom Brewery for a pre-game lunch. 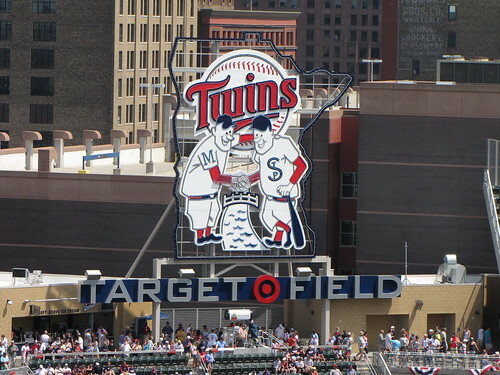 We finally were able to use the tickets I purchased in March for our first Twins game at the new Target Field. It was amazing. The game was great for the first seven innings, but the Twinks ended up losing to the TB Rays even after Thome hit several home runs to beat Killebrew's record. 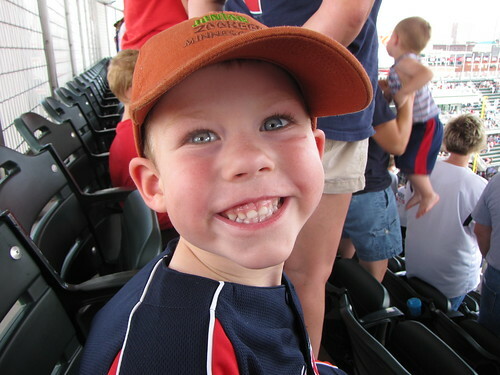 Benjamin loved his first outdoor baseball game. Sunday - Mike and I rose very early to drive into Minneapolis for the Red White and Boom Half Marathon. The race began at 6:30am, so I dropped Mike off at the start line and met up with Andy and Jennifer who were cheering in support of Jennifer's friend from Nebraska. Just as Mike approached the 3.5 mile marker where we were cheering, the heavens opened up and a torrential downpour started (no exaggeration!). 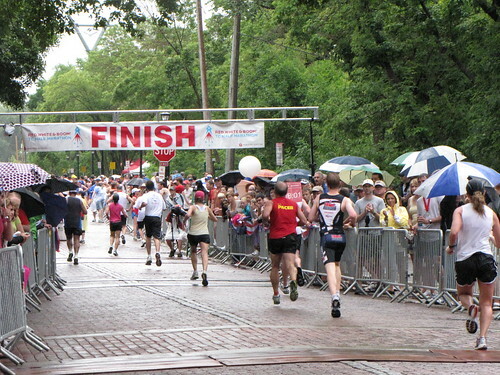 It rained throughout the entire race, but we were still able to cheer the runners on at 2 locations and the finish line. Mike had a great race and we even dried out after all of that rain! We ended up back at my parents house to celebrate the holiday with a nice boat ride, naps, bonfire and s'mores in the evening. We didn't make it out to a professional fireworks display, but could see (and hear!) all of the private fireworks around the lake. Monday - We spent the day with the Schmitts in celebration of Grandma Cindy's 59th birthday. The family met up at a park for a short picnic between the rain storms and then some relaxation at Andy and Jennifer's house. We headed back to Rochester before dinner and are now trying to soak up the last few minutes of the weekend.